Yea, but what baskets should I use and how much should I put into each? There are a number of so called "asset allocation" software programs on the market today. Some of these programs are offered by mutual fund and insurance companies allowing you to simply answer a questionnaire and their software will determine what asset mix you should hold. At the same time, these programs recommend their own products. Most advisors realize this type of approach does not give credence to a thorough and objective analysis. The basis for asset allocation was first established by Nobel Laureate Harry Markowitz. Markowitz, the innovator of Modern Portfolio Theory, came up with theories and mathematical formulas that allow securities to be mixed in the most efficient way. "Efficient" meaning the highest rate of return for any given level of desired risk. The programs we represent are designed to help serious advisors analyze the risk and return characteristics of client and prospect portfolios while at the same time, giving them a method of improving porfolio return and risk. Why should I consider using asset allocation software? As an investment advisor or financial planner, you are often asked to evaluate a person's existing portfolio. The client or prospect has probably spent time with another advisor or maybe they have been a do-it-yourselfer. As a rule, most existing investment portfolios you will run across have not taken into account the goals, objectives and suitability of the investor. Without some kind of quantifiable method of evaluation, it may be very difficult to illustrate just how good or bad the client's portfolio is. 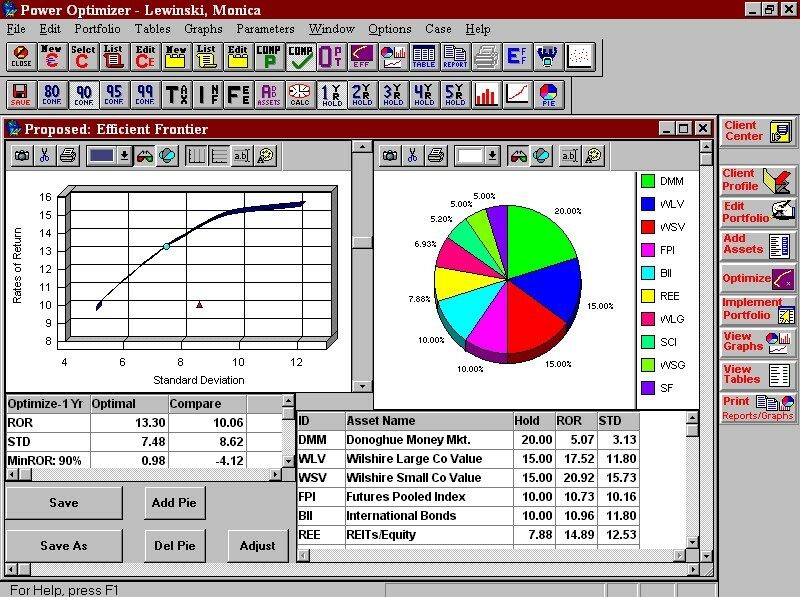 Enter asset allocation software that utilizes historical data and Modern Portfolio Theory. With Ramcap or Power Optimizer, you are better equipped to illustrate the risk and return characteristics of a client's current holdings or the portfolio you are recommending. You are able to present an investment policy statement that takes into account the client's investment objectives and tolerance for risk. With the software, you are able to increase the client's expected return while decreasing his expected risk. The allocation you recommend will have had a method. This method won't be some subjective process, but a process based on actual data, practical application and a Nobel Prize winning theory. Multi-security asset allocation, financial planning, security analysis, security information, asset class and other databases. Create user-defined security databases and portfolios; specify individual security characteristics; run historical or forecasted hypotheticals; optimize portfolio mixes; compare portfolios side-by-side; find assets to enhance portfolio return or reduce volatility; review detailed time-weighted cash flows. Investment Policy Statement, graphics, tables and reports are NASD compliant. Databases for mutual funds, stocks, variable annuities and closed-end funds are available. Power Optimizer incorporates flexibility with ease of use to make it the most powerful investment analysis and presentation tool on the market today. Power Optimizer allows the user to create portfolios using our databases of Stocks, Funds,Variable Annuities and up to 300 indices in any combination. The software can produce historic return and risk calculations on ANY set of assets and optimize the mix for a better solution. "Optimize" Portfolios · Show the "Efficient Frontier"
Provides a "Method to Your Asset Allocation Madness"
Brings in More Assets Under Management ! Power Plus includes Power Optimizer PLUS a history database of over 9000 mutual funds. 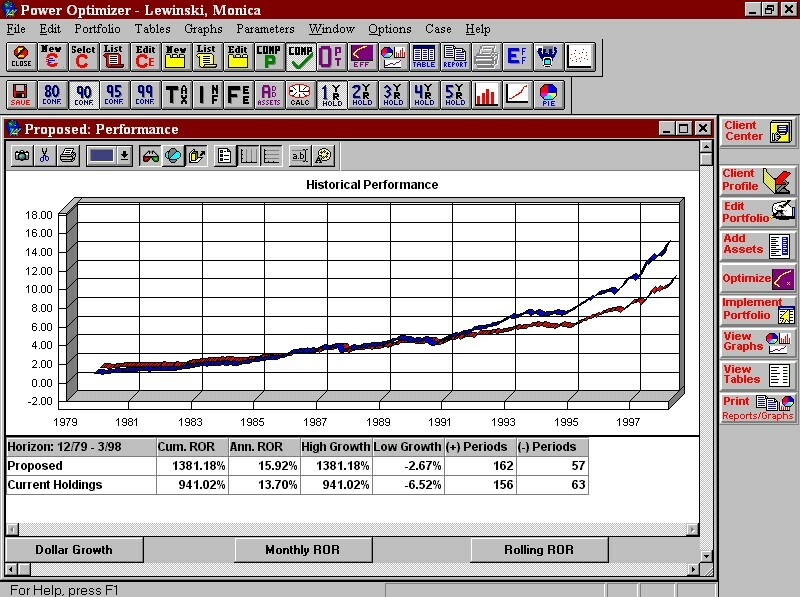 This Mutual Fund history allows you to optimize using the actual funds historic performance. Power Plus also includes the Scandata and Analytics programs for quick and portable searches and analysis of each security in a portfolio. This program uses sophisticated Modern Portfolio Theory algorithms to calculate the Efficient Frontier and pick a suitable portfolio on the Frontier. This "optimization" will allow you to increase the client's expected return while decreasing his overall risk. Multi-security asset allocation, financial planning, security analysis, security information, asset class and mutual fund databases. 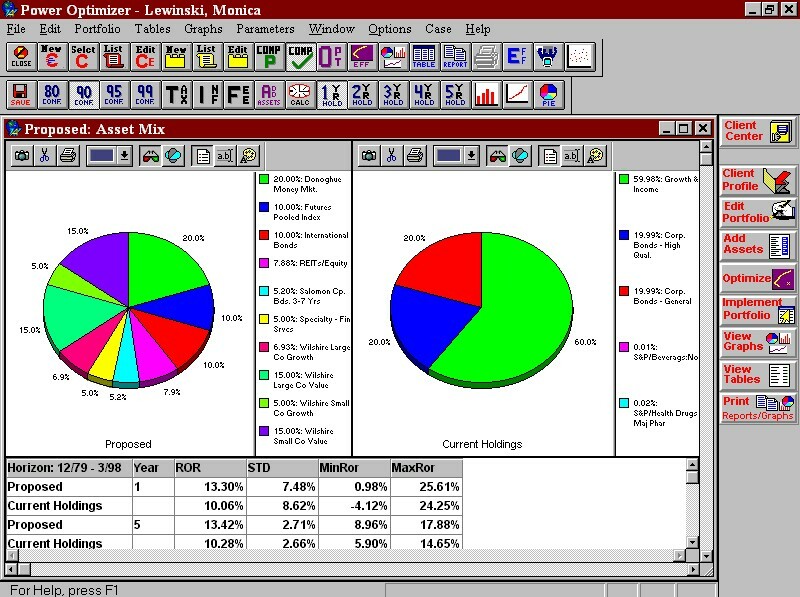 Create user-defined portfolios; run historical or forecasted hypotheticals; optimize portfolio mixes; find assets to enhance portfolio return or reduce volatility; find securities that match portfolio benchmark performance, determine quickly and easily if investment strategy will meet client's objectives; review detailed time-weighted cash flows. Includes Analytics, ScanData and the Mutual Fund Database. Databases for stocks, variable annuities and closed-end funds are available. "Communicate risk and return and gather more assets." Ramcap integrates ease of use with a built in "Wizard" to help you develop better portfolios for your clients. Compare current to proposed portfolios with a few clicks of the mouse. Ramcap comes with up to 300 indices updated quarterly or monthly. Ramcap includes information databases of over 7000 mutual funds and 6500 stocks allowing the user to have easy access to a securities details. 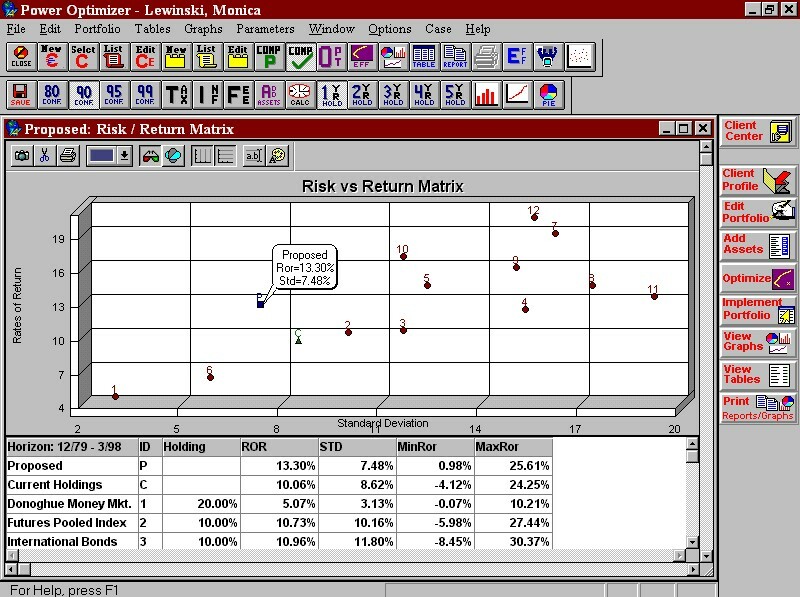 Enter your clients existing portfolio and the software displays historic risk and returns for any mix of assets. Compare side by side that mix to any index or another portfolio. The built in Slide Show allows for great presentations and seminars while the Client Center gives you a database to store personal information on your client. Excellent graphics can be flexibly changed to accommodate anyone's color or font scheme. The graphics and tables can also be exported to word processors and spreadsheets for your own customization. 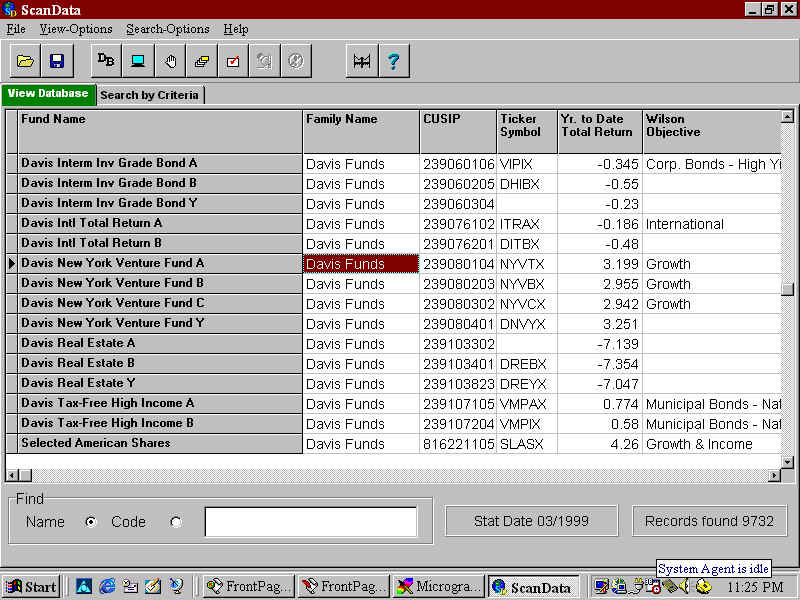 Ramcap Plus includes Ramcap PLUS a history database of over 9000 mutual funds. Mutual Fund history allows you to optimize using the actual funds historic performance. Ramcap Plus also includes the Scandata and Analytics programs for quick and portable searches and analysis of each security in a portfolio. Both programs use sophisticated Modern Portfolio Theory algorithms to calculate the Efficient Frontier and pick a suitable portfolio on the Frontier. This "optimization" will allow you to increase the client's expected return while decreasing his overall risk. Sorts and reviews over 180 fields of information on asset classes, mutual funds, stocks, variable annuities and closed-end funds. Information includes assets under management, historical performance, ranking among all funds and peer groups, P/E ratios, front-end loads, portfolio holdings and MPT statistics, dividends, P/E and P/B ratios as well as analyst's estimated earnings. Find all funds or securities that meet any set of criteria such as size, time in business, rates of return, beta, and Rsquared. Integrated with other Wilson programs for optimization & performance review. Have you ever added up the cost of all the software you subscribe to each year? It can be astronomical! Scandata software provides a database search engine for hundreds less than the competitors. Scandata includes up to 160 fields of data that can be searched and sorted on. The fund and stock reports are easy to read and well laid out. Scandata's biggest advantage to the competition is its integration with Wilson's asset allocation programs. Perform your search in Scandata and drop the results in Ramcap, Power Optimizer or Analytics. This integration saves time from double entry and time is money in this business. If you are looking for a growth mutual fund who has a beta of less that 1 and ranks in the top 20 percent of funds for the last 5 years, Scandata can find that fund(s). When you are looking for an oil stock that has out performed the S&P 500, Scandata can find it if its there. With Scandata's easy to use interface, getting up an running is a click away! Performance measurement, risk analysis, style and factor analysis, quantitative analysis of indices, securities and portfolios. Find securities that match or exceed the performance characteristics established for portfolio benchmarks. Databases available for asset classes, mutual funds, stocks, variable annuities and closed-end funds. Integrated with other AdvisoryWorld programs for optimization & performance review. I wonder what the Beta of Templeton Foreign is using the EAFE as the benchmark? Does Janus Twenty have a decent "risk adjusted return" relative to the Wilshire Large Cap Growth Index? How does Ford Motor correlate to the automotive index? These are questions that can be answered by Advisory World's Analytics software. Analytics gives the user the ability to compare any asset(s) against any other asset as the benchmark. With Analytics, you can perform calculations such as Rolling Returns, Sharpe Ratios, Betas, Alphas, Correlation's, Risk Adjusted Returns, Standard Deviations and many others. You can choose any time frame and any holding period. The software even allows you to sort on any of the calcs. Analytics produces customizable and exportable graphics and integrates with Power Optimizer and Scandata. Research has never been this easy!